The question I get asked the most after people book their sessions is, "what should we wear?!". I get it, choosing an outfit for yourself can be challenging, not to mention coordinating your husband and children too. It's a lot, and tends to be the most stressful part of the session, but stress no more! I've coerced my amazing friend Coelle into writing up her tips and tricks for styling a family for photos. She has a background in photography as well as interior design, and just has a great eye for coordinating ensembles. I hope you find her styling tips helpful when planning your own outfits for your photos, and be sure to visit her at Coelle Hope on Instagram, or coellehope.com for beautiful, family friendly design. I have worked in photography and currently work in interior design so styling for family photo sessions is sort of right up my alley. However, it can occasionally still throw me for a loop so I wanted to share the tips and tricks I stick to when planning that always help us look photo ready and still have each family member looking and feeling like themselves! Consider your session location! Unless the plan is to do something avant garde like wearing a ball gown in a corn field, which believe me, I am totally on-board with that act of personal expression! Just make sure you have that convo with your photographer to make sure everyone is on the same page. Back to the typical situation; if it’s an outdoor session and you have a running toddler, consider clothing that moves well, does not wrinkle easily, you can sit in it, hold your child in it without flashing everyone.That type of thing. Or if your venue is a modern art gallery and you have always wanted to rock stilettos for family photos- now is the time! Dive into your color palette! What colors do your family members usually wear? If you do the purchasing for your family, what do you gravitate towards? Stick within this realm for color. Same with patterns and textures! Stick with your comfort zone. If you never wear ruffles, don’t start for a photo session. We are mostly a solid and stripes type of family, so I embrace it when putting together our looks and can still create interest within our comfort zone. Lay out the plan! I usually start with my husband or myself because typically one of us has THE outfit or THE top I’m planning the entire look around. After that I move to the kiddos. This is where it can get a bit tricky because we have three boys and although I want us to compliment each other, I don’t want them dressed the same or even coordinated too predictably. Make sense? Example of complimenting children’s outfits for my family of three boys. All three outfits are the same level of comfy-casual but not too similar. These differences provide visual interest and give everyone their own look. child three: solid t-shirt with open cardigan and jeans. Create additional points of interest by giving everyone some fun personal style pops! Everyone gets something is my rule! I like to vary the location of the style pop on each person. So if one child wants to wear a hat, not everyone gets to wear a hat. Sorry, harsh, I know! This is a good opportunity to find something that is “so them” and years from now you will look and say “Ohh you DID always love red shoes!” You might be wondering how do I do this for my husband and I? Let me give you examples. Your husband can rock those trendy leather shoes (dark plain socks, of course) and his nice watch. He could also add some layers to provide that style. If he typically wears a t-shirt, make it a solid t-shirt and add a casual blazer, cardigan, or long sleeve pocket T in another solid color. If he has cute glasses he likes to wear (anti-glare please!!) have them wear those! And for me, my base outfit might be plain but I can add a scarf, and/or fun shoes. Or maybe I'll throw on earrings with a solid top but patterned skirt for a style pop. Remember how I mentioned the kiddo that loves red shoes? Well, I really want to talk a bit more about footwear. (Sorry, soapbox!) I really like to have the kids wear shoes that aren’t their everyday sneakers (unless your children somehow keep those looking good). I typically find “picture shoes” at either Target or Old Navy (the slip on All Star knock-offs work great!). Trust me, you will look back at those photos with everyone perfectly styled and then those darn every day sneakers will stick out like a sore thumb! 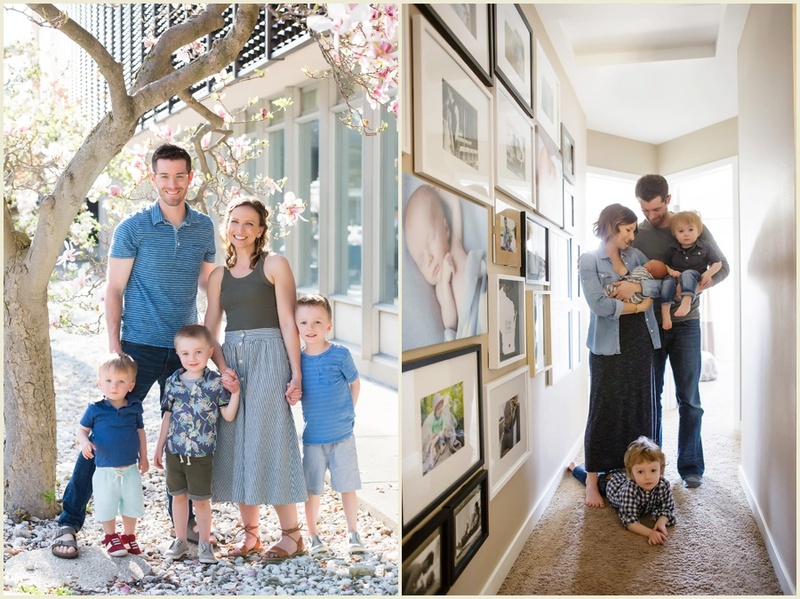 After reading those tips, now you are ready to plan and style your family photo session! You've got this!